Click your heels three times! I’m betting that you recognize we’re in the realm of sorcery. And you immediately know we’re talking about someone with supernatural powers. Because whether it’s a witch or wizard, an illusionist or fairy godmother, you understand at some level that they possess the power of incantation. The power to use language to state what is and will be in ways the rest of us mere mortals can’t. But wait! What if you could use magical words? What if you did have access to your own version of personal wizardry? Actually, we all do. And producing it doesn’t require us to join a secret club, swear a blood oath, or be born the seventh son of a seventh son. Quite the contrary. We can tap into this power any time, when we call forth our magician archetype. Last week I wrote briefly about archetypes, those transcendent stories, myths, images, patterns, and symbols that are hardwired within us. Our internal cast of characters, if you will, often operating at a deep unconscious level. 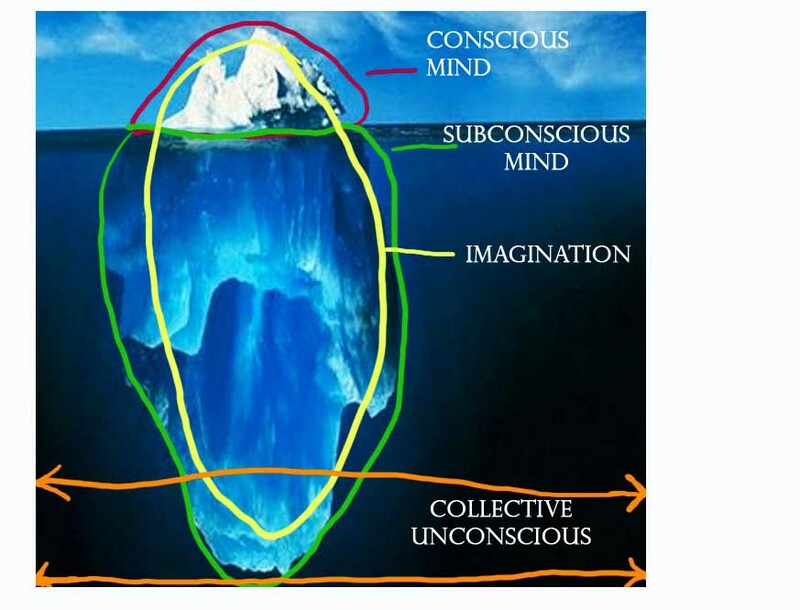 Carl Jung believed that the human psyche is like an iceberg, and the parts that we see and know are just the tip of said iceberg. Which means a vast amount of who we are resides in the watery depths beneath the surface. So go ahead, dive in, the water’s fine. Well, maybe a little cold, but you’ll get used to it. And as a matter of fact, if you’re looking to hook up with your magician archetype, you’ll find scads of raw material all around you. Because the magician archetype is alive and well in movies, literature, and television. We’re surrounded by it. Think Harry Potter. Twilight. Simon Cowell. (Okay, I’m only halfway kidding about him. Stick with me and I think you’ll see what I mean). Not surprisingly, the magician archetype is about transformation, both positive and negative (more in my next post about the negative stuff). When we’re in its grasp it pushes us to listen to intuition, pay attention to synchronicity, and act on hunches and sometimes hazy impressions. Sounds interesting, right? But how do we do that? For most people this is where the rubber meets the road. It’s all well and good to imagine our inner transformative powers, but it gets confusing when we try to actually bring them out into the real world. After all, most of us aren’t blessed with Merlin’s supernatural powers, or for that matter, even a standard issue crystal ball. But what we do have is WORDS. We have the POWER OF NAMING to transform seemingly ordinary, even limiting, ideas or situations into extraordinary possibilities. Which is exactly what Simon Cowell does. He names people, who they are and what they will be, in a seer-like way. Of course he doesn’t always focus on possibilities. And that’s the danger when we let other people name us. Can you guess what I did? I retreated a little, stumbling over myself, “Well, you know, not really, I mean, come on, um, lots of other people…” My words faded out, and I’m sure this lovely man thought I was a bit addled. But at that point in my life, I didn’t yet understand the power of naming and being named. I learned a lot in the ensuing years, though. In the very first group I facilitated (for creative souls), one of the participants told us about a tribe in Africa that had a magnificent response to compliments: “YOU’RE RIGHT. THANK YOU.” Our group broke into goofy laughter at this, but soon we all began practicing it. It felt good! Mind you, this power of naming, in its genuine form, is not about ego or bluff or bluster. It’s more like crossing a bridge that you didn’t quite know you were on. An experience of finding your own voice. A moment when you have clarity about who you are and you express it in some way to the world at large (or accept it when another magician expresses it for you). I had an unexpected rendezvous with this a while back. For several years, my husband and I trotted ourselves around to conferences, events, and other such affairs, doing a series of (unpaid) workshops. We learned a whole lot, upping both our competence and confidence in the process. So at some point we started wondering about the next step. Could we get paid? Maybe a professional development institute? A seminar? Or a keynote presentation? That seemed big. Pretty much unreachable, given the usual suspects at these shindigs. At that moment I finally got it, this power of naming. And I’m absolutely convinced it was an encounter with my magician, because in the next two years we did three professional development institutes and a keynote presentation before an audience of 400 people. Most of my own magical naming experiences have been around purposeful work and my callings. But as I’ve seen in my work with others, naming can show up in any area of life. I’ve witnessed a young, uncertain woman about to turn 30 name herself as an adventurer, and take off on a cross country RV trip. And a woman at midlife proclaim herself as someone who has a right to ask for her needs to be met. And a man about to retire announce himself a marathon runner. And as you’ve no doubt noticed, you don’t have to traipse very far into the blogosphere to discover many outposts where the magic power of personal naming is alive and well. As powerful as these individual naming experiences can be, however, there’s also another form of naming, that proclaims something larger. Naming that takes us out of our individual stories and into our sense of collective possibility. You’ll find a great illustration of this if you click over to the halfway point. Last week Belinda Munoz named a new movement that’s brewing: Can You Feel the Change? It’s a superb and inspirational act of both personal and community wizardry, so check it out. So how about you? What’s your experience of your inner magician? How has the power of naming shown up in your life? And what do you choose to name as your own true voice? (p.s. Stay tuned for my next installment about the other side of the magician: Dark Magic and the $97 Book). Oh, how wondeful that sounds and it also legitimize the person who ‘names’ you. Not receiving the other person’s naming sound like we think their observation is not worth listening to, oops. I am slowly atarting to see that naming can be powerful and is a confirmation about who you are and one that you can live into. Jan Lundy asked us to give ourselves a name and I am ‘she who looks beyond’ and that is becoming actually a powerful action for me now I named myself that. It means not looking at appearances but at possibilities and it does encourages me to do just so. Hmm. Patty, I think you’ve just simplified the half-step that too often many of us hover around but hesitate to take, mainly due to insecurity or lack of validation would be my guess. I say half-step because as you say, it’s just like crossing that bridge you didn’t know you were on. When we write, we do what a writer does yet we hesitate to call ourselves writers. When we paint or draw or sculpt, we make art yet we’re reluctant to call ourselves artists. The power of naming, calling ourselves artist or writer, may just be the validation needed that flips that switch in our mindset toward legitimacy and more. Oh, and thanks for the mention! I really appreciate it. Hi Wilma – I want a name like that! I have a life purpose statement that I could tweak, and make it, “she who dives deep.” What do you think? Hi Belinda – You articulate it perfectly. So many times I have worked with people who say, “Oh, I wouldn’t CALL myself an artist (or writer or whatnot). I think it’s insecurity but also fear of sounding like we have really big egos. But there is a middle ground between self-aggrandizement and humility. One of the best things a colleague ever said to me: “You’re too humble.” It shocked me a bit, and truly made me think. Hi Patty – Thank you for this thoughtful and intuitive post. Naming is so very important, as words have creative power. “In the beginning was the Word.” Beginnings start with words, naming. Shakespeare “asked what’s in a name?” In fact, everything. “As a ‘man’ thinks in his heart so is he.” Naming is a process of becoming. There is a reason why the poet Gertrude Stein just doesn’t say “a rose is a rose.” She says “a rose is a rose is a rose.” Thanks again. Happy to have found you. Hi Amanda – So true, it is an existential process, naming. In doing so we answer the question, “Who am I?” And that closeness you talk about moves us toward self love, don’t you think? Thanks! Hi Judith – Ah, wonderful reminder about Shakespeare and Gertrude Stein. Poetry. And it occurs to me that poetry is a particularly potent form of naming, because the words do have so much creative power, as you say. And there must be power in threes. I’m thinking of “There’s no there there.” Gertrude must have been on to something! Thanks so much for joining the conversation, and I’m glad to have found you too! Patty, Thanks for finding my blog, so I could find yours. I very much like your clear writing style, and ability to convey profound concepts in a very inviting way. As so much of the world has become tone-deaf to the world of symbol, we who are trying to bring this message into the world (with the power of words)need to provide each other with mutual support. I’m glad to know you are out there doing this work! I’ll be adding you to my blogroll. Thanks so much, Glenn. I enjoyed your blog too, and it’s always nice to know there are kindred souls out there. I look forward to continuing the conversation! Hi Patty, ‘she who dives deep’ sounds like a great name, especially as it will mean just that and will encourage you to do just that.